Elemis Biotec delivers 6 new highly-effective, super-charged facial treatments to re-boot cellular performance, enhancing the skin’s ability to repair, renew and re-tone. Revealing a new generation of facials, each treatment targets specific skin needs to deliver immediate, visible, long-lasting results. The skin’s unique bio-chemistry is constantly compromised. Lifestyle, sunlight, stress, age, illness and medication cause a breakdown in cellular energy and communication, resulting in a weakened skin structure, stressed and unbalanced skin. Unresponsive cells need new stimuli to help re-boot cellular performance and re-establish effective cell communication, enhancing the skin’s ability to repair, renew and re-tone. After in-depth studies and research, Elemis found that combining a unique synergy of 3 targeted stimuli – touch, technology and actives – it was possible to deliver immediate, visible and longer-lasting results. The Ultrasonic spatula uses a highly effective Piezoelectric current causing 27,000 vibrations per second through a quartz/ceramic head – drawing out impurities, deep cleansing and gently exfoliating surface impurities and pigmentation. Whilst stimulating collagen production to minimise the appearance of fine lines and accelerate blood and lymphatic circulation to aid the healing process. 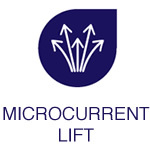 Microcurrent is the only aesthetic technology that can physically firm and tone the skin, using small pulses of microcurrent – direct to the belly of the muscle. Each pulse mirrors the body’s own natural current, stimulating the skin’s biological energy to re-educate and strengthen muscle memory for significantly firmer, more defined facial contours. Improving production of collagen elastin, whilst also stimulating the micro-circulation to encourage the healing process, improving scarring, sun-damage, pigmentation, and blemishes. 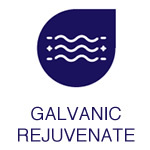 Galvanic is a two-step treatment that works synergistically with positive and negative charged ions to propel similarly charged, high-potency actives deeper into the skin. Minimising the symptoms of ageing bought on by stress and tiredness – fine lines, dullness, photo-ageing, sensitivity and blemishes. Step 1 – combines negatively charge ions and actives, resulting in them repelling one another, causing them to force out impurities and deep cleanse the skin. Step 2 – both positive and negative ions are applied to the skin to stimulate and redistribute the skin’s natural energy, instantly rejuvenating. 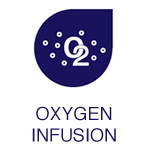 O2 Infusion therapy uses powerful bursts of compressed air to infuse the skin with a combination of 95% pure oxygen and selected high-potency actives to help visibly plump out fine lines and increase skin firmness. Whilst helping restore elasticity, stimulate tissue repair, heal and rebalance the skin the O2 infusion delivers a refreshed, radiant and healthier looking skin. Light Therapy emits energy in the form of red or blue light into the deeper layers of the skin. Light energy is found in every nerve, cell, gland and muscle of the body and each emits its own unique frequency vibration. 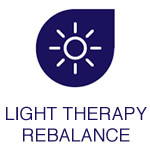 The specific light wavelengths have a bio stimulatory action on the cells to normalise and rebalance the skin. Red Light – stimulates collagen production, increasing cell renewal and boosting the mirco-circulation to plump and smooth the appearance of fine lines leaving skin feel firmer and tighter Blue Light – delivers a powerful anti-bacterial effect to minimise skin- bacteria. It will soothe and calm, whilst reducing redness with is anti-inflammatory properties. Unique to the BIOTEC facials are 7 high-potency activators. Each intensive complex of powerful plant actives, peptides, anti-oxidants and essential oils are expertly formulated to provide the catalytic power behind the facials and penetrate deep into the skin. Hydra-Active Gel Masks for the face and eyes deliver super-hydration and a luxurious Amber Massage Balm stimulates specific skin responses for maximum results. Pea Peptides moisturise and protect whilst Hyaluronic Acid carries moisture deeper into the skin to plump and tone. Acai, Noni and Moringa Seed Peptides are a powerful antidote for dull, uneven and dry skin. Used in the Sonic Skin-Radiance Facial. Padina Pavonica, African Bark, Tri-Peptides and Red Seaweed, smooth, plump and minimising the appearance of fine lines and deep set wrinkles. Camelina Oil helps maintain cell regeneration and Chlorella Vulgaris helps tone and firm. Used in the Triple-tec Anti-Wrinkle Facial. Lactic Acid, Hyaluronic Acid and a unique blend of essential oils including Sandalwood, Thyme and Lemon stimulate the skins natural cell renewal to even skin texture and tone, deliver visibly smoother skin and provide essential moisturisation. 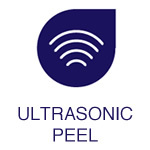 Used in the Sonic Skin-Resurfacing Facial. Gardenia, Centella plant stem cells, Lupin and Alaria Esculenta seaweed target facial sagging. Increased hyaluronic acid production improves moisturisation and boosts cell energy. Used in the Micro Firm-a-Lift Facial. Rosalina, Lavender and Sweet Marjoram essential oils aid skin repair, help de-stress skin and clear pores. Swelling, redness and breakouts are reduced, whilst post blemish imperfections are minimised and moisture levels improved. Used in the L.E.D. Blemish Control Facial. Frankincense and Canadian Willowherb significantly improve redness and heat in the skin with its anti-inflammatory properties. Calm and balance are restored, whilst vital moisture is replenished. Used in the O2 Sensitive Skin Soothing Facial.